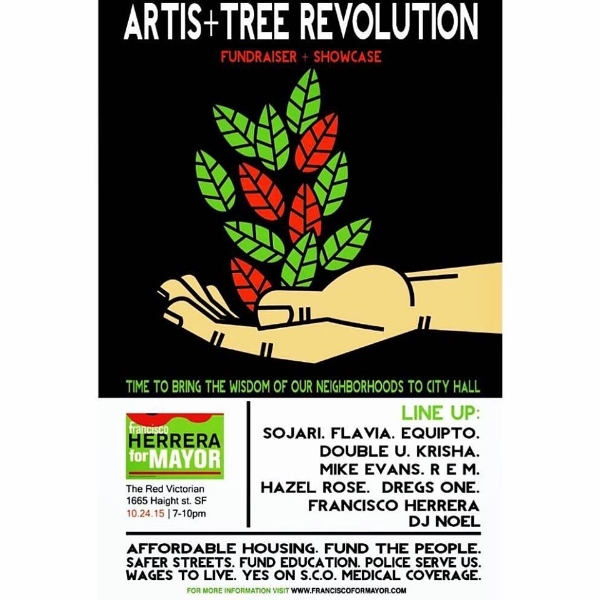 October 27, 2015 - Last Saturday night at the Red Victorian on Haight Street, a group of young people called ArtIsTree Revolution (defined as “artists coming together for growth”) threw a fundraising party and talent showcase for Mayoral candidate Francisco Herrera. In the spirit of small-d democratic cooperation, candidate Amy Farah Weiss showed up, too. I sat in the audience and looked at the remarkably diverse group around me, attentive and enthusiastic, and wished that every person I’d ever heard express cynicism about young people’s political involvement could be there to see this. Especially when one of the hosts asked everyone planning to vote November 3rd to raise a fist -- and every arm in the room went up. The first ArtisTree Revolution took place last month in the Mission, and though it was heartfelt and inspiring, it had more of a friends and family feel. This time it was exponentially larger, and had the unmistakable energy of a surging movement. Every performer expressed a degree of anger and frustration at the current state of San Francisco – rapper Dregs One’s passionate history lesson on greed and exploitation in the Bay Area was a searing high point – but what was most striking was the generosity and love in the room. The performers’ eloquent messages were less about hating developers and tech invaders and more about the deep attachment to the city these young people feel – most grew up here; all are afraid they will be forced out. I heard call after call for unity. I heard acknowledgement that a city should prosper and thrive, but not at the expense of ordinary people; not at the expense of giving up its soul. The crowd shouted in unison to MC Hazel Rose’s “Wakin’ Up the City” (full disclosure: she’s my daughter) and when local star Equipto sang his joyful anthem “Heart and Soul (of Frisco City)” everyone was on their feet, arms waving, singing along at the top of their lungs. As I looked at these young faces, the rhetoric about affordability became desperately real. These youth are the people we need to stay in San Francisco. If we make it impossible for these young artists, musicians, teachers, workers to live here, we lose what is best about us. It’s not about leaving our hearts in San Francisco – it’s about the risk of losing our heart, maybe for good. But there is an alternate future, and Saturday night at the Red Vic I saw it. I saw the San Francisco I want to live in for the rest of my life. Leaving the event, I talked with Francisco Herrera and he emphasized this is not about one election, but about building community for the long haul. These young people are committed to that fight, and they’re doing it to music. I’m with them.